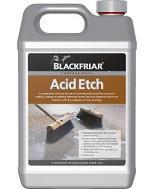 A preparation solution for use on concrete and screed floors prior to sealing,coating or painting. Removes excess lime dust (laitence) which can interfere with the adhesion of floor coatings. key features & benefits, Etches power floated, very smooth, hard or chemically treated concrete floors to key the surface and improve the adhesion of floor coatings. application. Stiff bristled yard brush or squeegee mop. 5lt only. coverage up to 7m sq per 1 lt.